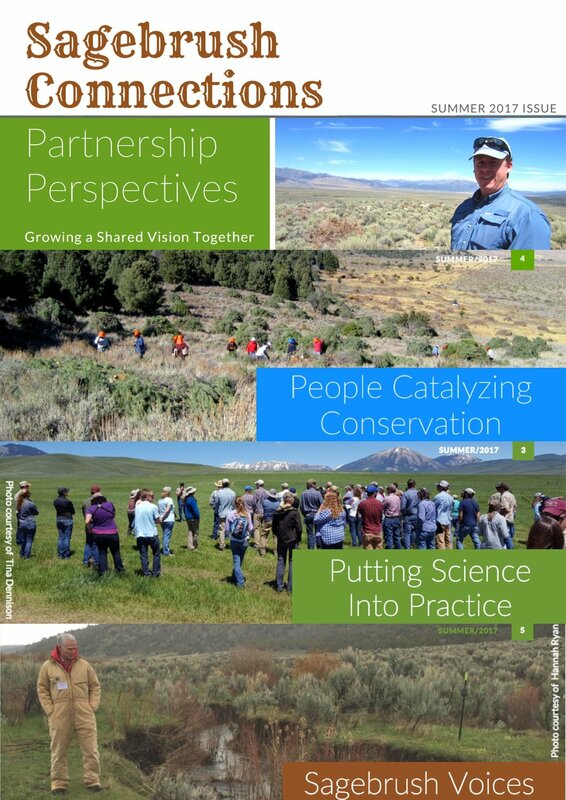 Sagebrush Connections is a magazine-style publication about the proactive sagebrush conservation alliance between the Intermountain West Joint Venture, the USDA's Natural Resources Conservation Service-led Sage Grouse Initiative, and the Bureau of Land Management. For decades, partners have invested in conserving the sagebrush sea to ensure that it sustains livelihoods for people with abounding water, energy, food, recreation resources, and habitat for over 350 species. Together we are making a difference by working across fence lines and in local communities to support sagebrush lands and rural economies. This first issue of Sagebrush Connections shares short stories about water. In it, you will find a letter from a key partner about their goal to ensure this ecosystem will function for people and wildlife long into the future and how water is central to this functionality. Another story is about the West’s Emerald Isles and how the wet areas in sagebrush country serve as grocery stores for wildlife by providing irreplaceable forage, water, and habitat. There is also a quick read about simple yet significant restoration practices that mimic natural methods for keeping water on the landscape. · Sagebrush Voices, which keys in on the people sparking conservation action and making a difference in sagebrush country. Please contact us if you have something that could be featured in this publication. Stay tuned to hear the next issue’s theme.